The outcome of the Russian Presidential elections may not change Russia's relations with the West; but it would narrow down the time frame for deciding the Russia's future after Putin. Unlike in liberal democracies where election results are often unpredictable, Russia's case is different. With opinion polls showing an assured victory for the current President Vladimir Putin, Russia is all set to go for elections on 18 March 2018. Putin's fourth presidential election victory would make him the second longest serving political figure in Russia, only next to Joseph Stalin's reign of 24 years. During the 26 years of post-Soviet Russia, Putin has been in power for almost 17 years. 2018 marks his 18th year in power and a win in the forthcoming elections would guarantee his indisputable rule in the country till 2024. However, it is important to assess the upcoming Russian elections in terms of the voice of dissent -- embodied in the form of Alexie Navalny, Putin's strategy of retaining power and what the elections mean for Russia's relations with the West. The Russian Central Election Commission has registered eight candidates for the election to country's highest office. The list includes incumbent President Vladimir Putin as an independent candidate; Liberal Democratic Party of Russia (LDPR) leader, Vladimir Zhirinovsky; Communist Party nominee and businessman, Pavel Grudinin; and one of the founders of Yabloko party, Grigory Yavlinsky. Other approved candidates are Ksenia Sobchak of the Civil Initiative party; Maksim Suraikin of the Communists of Russia Party; Boris Titov of the Party of Growth; and Sergei Baburin, the leader of the Russian All-People's Union and former Deputy Speaker of Russia's State Duma (lower house). As comprehensive as the list of candidates may sound, none of the candidates present a real challenge and opposition to Vladimir Putin. In fact, as per the outcome of the recently conducted poll by the Russian Public Opinion Research Center, during 29 January-4 February 71.4% of the people prefer Vladimir Putin to remain as their president. The poll shows a relatively low public acceptability for other candidates. The second after Putin in terms of popularity is Pavel Grudinin of the Communist party with an approval rating of less than 7%. The popular TV personality in Russia, Ksenia Sobchak has failed to generate any interest among the Russian public, despite her campaign slogan of 'against all'. Many critics of Ksenia Sobchak have pointed out that her participation in the election race is purportedly staged by the Kremlin to entice Alexei Navalny's potential electorate and to generate a considerable turnout. One of the problems with a predictable election is that when the result is well-known in advance, people tend to ignore it and not come out to vote. This forces the authorities to look for innovative ways to attract voters to the polls and ensure a high turnout for greater legitimacy. This perhaps explains why Ksenia Sobchak gets away even when she openly criticizes Putin for his actions in Crimea and the situation in Ukraine, other than the fact that Putin was the protégé of Ksenia Sobchak's father, Anatoly Sobchak, the former mayor of St. Petersburg. For Ksenia Sobchak, the current election could be an opportunity to present herself as a legitimate politician and prepare herself as a viable candidate for the post-Putin future of Russia, even though the likelihood of people vouching for her as president remains low. The real opposition to Vladimir Putin could have emerged from Alexie Navalny, an anti-corruption activist and a vociferous Kremlin critic. Although it is far-fetched at this point to say that Navalny could have won against Vladimir Putin, given the latter's massive popularity and long years in power, Navalny's incident does represent an interesting case of what could go wrong with leading an opposition against a massive leader like Putin. Having caught the public eye by releasing a secret investigation video into the private finances of Prime Minister Dmitri Medvedev, accusing him of amassing wealth totalling over US$1.2 billion, including lavish mansions in Russia and several properties in Italy, Navalny sparked a great deal of public interest in corrupt practices and activities of Kremlin leaders; and by doing so, created a massive following both in his public rallies and on social media. Navalny's increasing presence on social media with his YouTube channel “АлексейНавальный” made him popular, especially among the younger audience. Currently his YouTube channel boasts of around 1.7 million followers, with an average viewership of several million. The videos serve as a great source of disseminating information and commentaries on corruption and keeping the audience informed, bypassing traditional media sources such as Russia Today and Sputnik News, on which Kremlin holds control. Navalny's ability to attract substantial number of people to his rallies, his massive outreach with the younger audience on social media and his anti-corruption political campaign made him a serious threat for the administration in Moscow. Not surprisingly, the Kremlin responded by denying him the opportunity to run for election. On 25 December 2016, the Russian Central Election Commission denied Navalny the opportunity to register himself as an eligible presidential candidate citing a 2013 controversial embezzlement conviction for which he received a five-year suspended sentence. Navalny has responded by urging his supporters to boycott the voting day. However, that would have a negligible effect on the outcome of the elections. Navalny's tussle with the government might have resulted in him not being able to stand in the elections, but his actions have given him the much-needed dose of popularity to invest his time and energy in projecting himself as a viable candidate in the next presidential cycle. In this background, it is critical to look at how Putin has been able to maintain a high level of popularity, in spite of slower economic growth and troubled political relations with its western neighbours. Going into the elections, Putin has pledged to allocate more money to education and healthcare; promised higher wages with hopes of considerable economic growth, better infrastructure and security; and a more rigorous fight against corruption with better governance. Although these promises may reflect what people want from their government, the actual requirement for reforms in the economy, fair competition with minimal government regulations and scrutiny have failed to gain traction and become a reality. As Chris Miller has recently argued in his article, the success of Putinomics depends on a three-pronged strategy -- macroeconomic stability, labour market stability, and limiting state control to strategically important sectors. Russia has survived and partially recovered from the dual shock of falling oil prices and economic sanctions imposed by the West. In doing so, Putin has made sure that the market and financial stability of the country is maintained. The country's debt in the international market is kept in check and inflation is kept low. Any voices of discontent are silenced by guaranteeing employment and steady pensions. At the same time, private sector competition is encouraged in sectors where it does not come in conflict with the government's interest. The strategy of Putinomics falls in line with the election promises. Even though one can argue that such a strategy may not result in drastically improving the economic fortune of the country, it works for now, keeping the country stable and silencing dissenting voices. Putin's economic strategy also goes hand in hand with the positioning of Russia as an important player in the international system. Following the reunification with Crimea and Sevastopol in March 2014, Putin made it abundantly clear that he was ready to defend Russia's interest against the threat of alleged NATO expansion. Similarly, a significant geopolitical accomplishment, outside the borders of the erstwhile Soviet Union, came in the form of Syria. 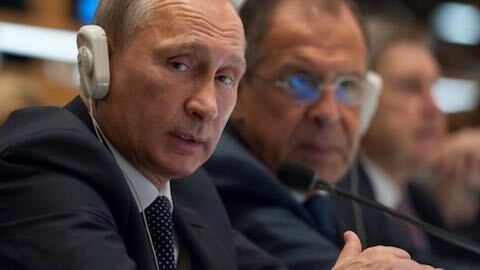 Russia not only achieved its immediate objective of ensuring the stability of Bashar al-Assad's regime but also defeated the forces of the Islamic State (IS). This dual accomplishment has made Russia an influential player in the geopolitics of the Middle East, thereby confirming its status as an influential global power. What is equally remarkable about these accomplishments is the ability to sell them to the public at home. The deliberate use of media to project Russia as a victim of Western economic sanctions has enabled Putin to direct everything bad that has happened to the economy to the West. Similarly, Putin's decision to help preserve the existing regime in Syria along with the alleged NATO expansion through Ukraine has also worked in his advantage to further his geopolitical objectives. The use of information warfare, whether through the spread of fake news or meddling in the United States (US) elections, further supplements Russia's hybrid warfare strategy against the US. This strategy is important as it not only sets the narrative of debates on popular US news channels; but also, the inevitability to prove the Russian hand coupled with the deniability of Russian involvement by the US President, enables Putin to sell the idea of Russia as a villain in the West at home. All of this explains why Putin has been able to enjoy such high popularity in Russia over a prolonged period of time. This also paves the way for his fourth consecutive win. Is the election going to change Russia's engagement with the West? The short answer is 'No'. The adoption of the Countering America's Adversaries Through Sanctions Act in 2017, as the mainframe of the US policy towards Russia pretty much elucidates which way the relations between the countries are heading. The law names Russia as an adversary of the US and justifies the imposition of sanctions as a way of targeting and handling an adversary.In Europe, the problems with the implementation of the Minsk agreement and ending the violence in Donbass have become a major impediment in improvingrelations. So far, the Western response towards Russia, in terms of economic sanctions and international isolation, has failed to bring out any change in Russia's foreign policy. On the contrary, as explained above, Putin has been able to use the Western response to his own advantage, which not only helps him sustain a high level of popularity in Russia, but also secure decisive public approval for pursuing an aggressive foreign policy. The outcome of the upcoming elections may not drastically change or normalise Russia's relations with the West; but it would narrow down the time frame for deciding the future of Russia after Putin's period in office. There are a lot of questions with regard to how the leadership is going to change once Putin leaves office. Will he pick a successor or find a way to stay in power beyond 2024? Is that successor going to be a member of the siloviki group, or someone like Alexie Navalny? How different is the political environment in Russia going to be six years from now? Will the change in the leadership have any effect on Russia's engagement with the West? All of these are daunting questions which can only be answered over time, but the onus is both on the President and the Russian public on what they think and decide for the future of Russia. Trivun Sharma is a Ph.D. candidate at the Faculty of Political Science and International Studies, University of Warsaw, Poland. His working thesis is entitled, “Changing Dynamics of European Geopolitics: A Case of Russia and Germany”. His primary research interests include European geopolitics, the role of Germany in Europe and Russia's foreign and security policy. Europe: "Russian Presidential Elections: Expecting the Expected"